How would you go about integrating a series of very different historical buildings, with elements dating from the 5th century, the 15th, the 18th and the 20th, and uniting them as one, visually coherent, hotel entity? 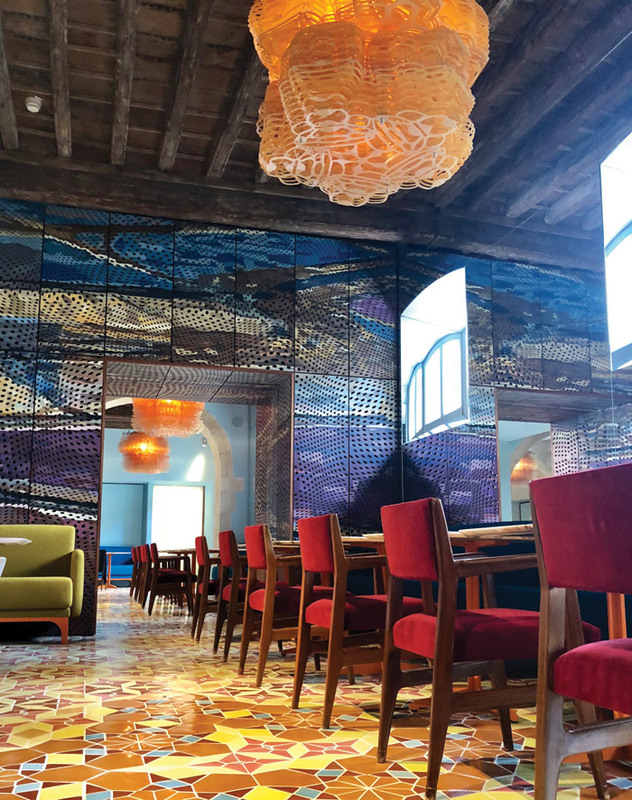 Very few would take the path that Jorge Pardo has with hotel L’Arlatan: instead of stripping back the complexities and clashes of aesthetics, period and style, Pardo has gone the other way. 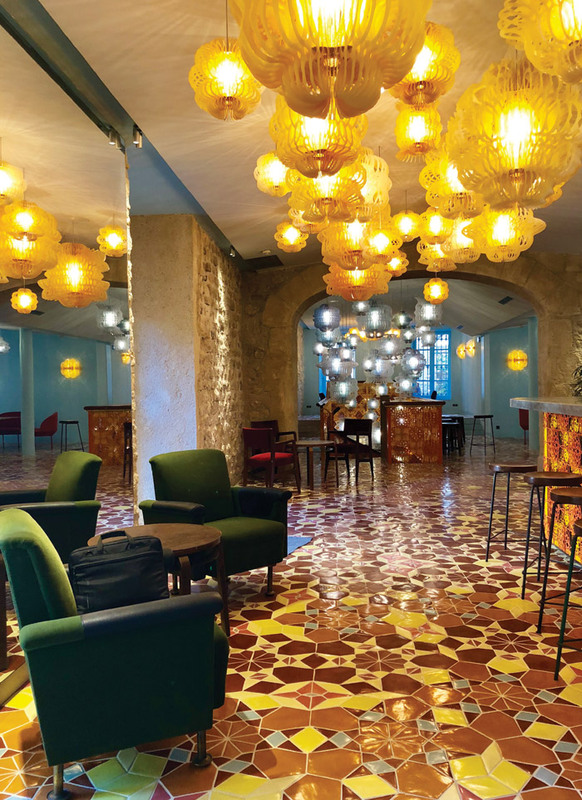 He has thrown more complexity, more colour and more texture at the hotel in the historic Provençal town of Arles. But then Pardo is an artist, not a designer. His work is not restricted to what is on trend. He is no slave to the fickle mistress of market forces that keeps commercial hoteliers and restaurateurs awake at night, forcing them to hire the latest, hottest interiors or hospitality gurus to transform their establishment into something completely ‘now’. He can rely, instead, on his own internal compass. Though he has form with interiors: his particular art practice typically includes quirky lamps and lighting designs, furniture and buildings as well as prints and paintings. His CV includes a flamboyant multicoloured bus shelter for Portland, Oregon; a pier on a lake in Münster; and the house he lives in when in LA – 4166 Sea View Lane – which started out as an art commission from the Museum of Contemporary Art. It was his all-encompassing approach – his commitment to making art a part of living – that appealed to L’Arlatan’s owner, collector and philanthropist Maja Hoffmann. 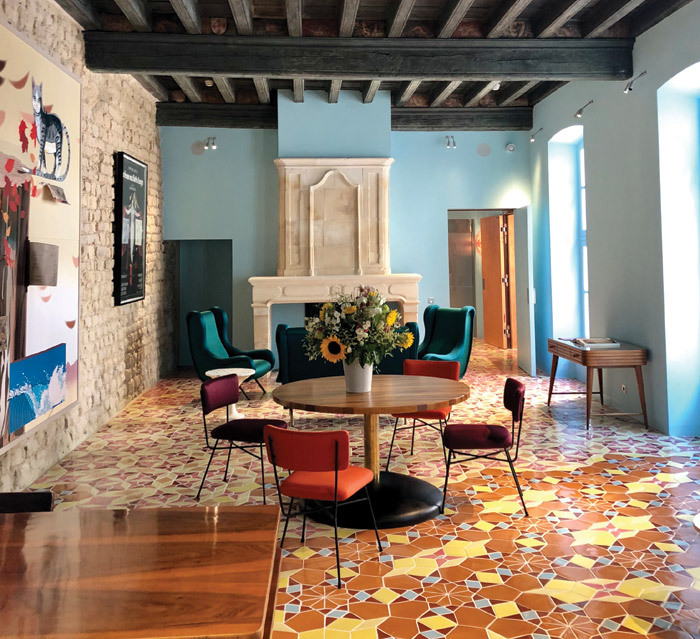 In 2014, she bought what was then a faded, three-star hotel, a stone’s throw from Arles’ famous Roman ruins of amphitheatre and stadium, and a half mile from the 10 ha former railway yard she is transforming into a major site of cultural appreciation and production, the Parc des Ateliers. Heiress to the F. Hoffmann-La Roche pharmaceuticals fortune (though the family long-ago divested themselves of labs and manufacturing) Hoffmann is, seemingly, on a one-woman mission to transform Arles – once a national hub for train engineering – into something more than just a charming stop for those on the Vincent Van Gogh art trail (van Gogh fell in love with the region and dreamed of setting up an artist colony here) or pilgrims to its annual photography festival Les Rencontres d’Arles. To aid its transformation the lack of interesting hostelries was something she had the vision – and bank balance – to tackle too. Having acquired a few of his works in the past, Hoffmann invited the Cuban-born Pardo over from his studio and workshop in Mérida, Mexico to have a look at the place, offering him absolute carte blanche if he would only turn these weary buildings into a Gesamtkunstwerk (a total work of art). And that is exactly what he has delivered. For the past three years, Pardo and his studio team (expanded from 13 to around 20 for this project) has been designing and making almost every single item in this extraordinary hotel. That includes the huge poured-concrete helical staircase, which takes guests up to their rooms from the restaurant, past the fourth-century Roman wall left over from the basilica, on which more recent structures were built. Most spectacularly it includes more than one million hand-made ceramic tiles, scattered over every floor surface and even up the bathroom walls. Coupled with these tiles, Pardo’s studio also designed and created some 400 lamps and lanterns for the hotel. 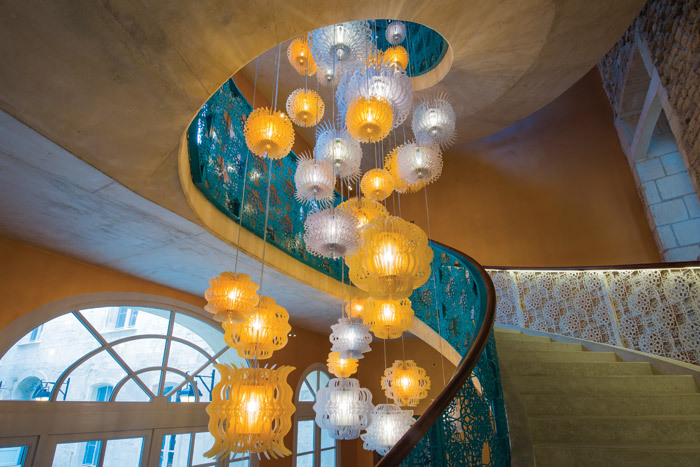 These exotic sculptural items are wall-mounted or suspended, sometimes singly or – over staircases – in clusters, like a swarm of pulsating jellyfish. They are made from sheets of semi-translucent recycled plastic, laser cut into intricate, organic patterns and shapes. 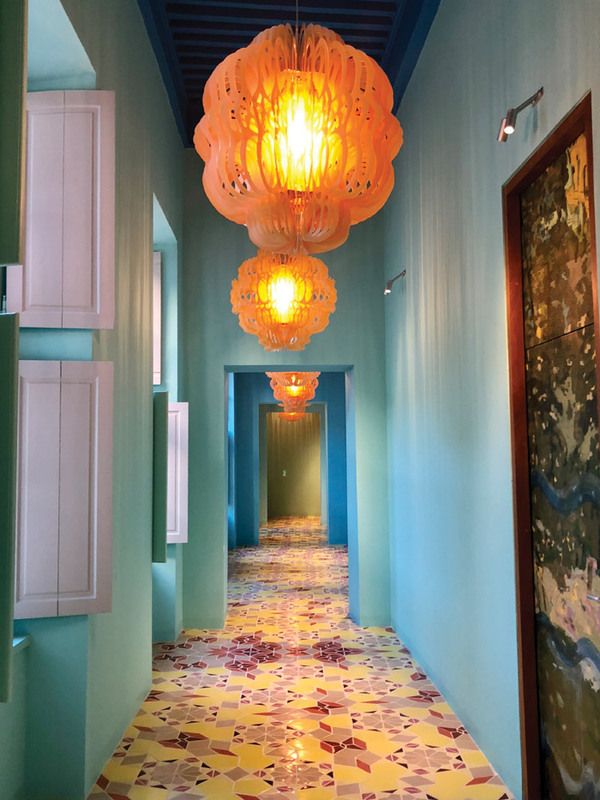 The colour palette for these lights – from coral pink to Cerulean blue – is of a similar family to the floor tiles but usually deployed within the scheme in such a way as not to match or tone, but clash. The layers and leaves of their structures cast fascinating shadows on the walls and floors through the day and night. There is a similarly rich and fascinating shadow play from the many areas where Pardo has deployed laser-cut grilles – in balconies, over doorways. These, and about 1,300 individual pieces of furniture were made by hand in his studio, including marquetry coffee tables, cane bedheads, rocking chairs, eccentric (and rather flimsy) wardrobes, and footstools. In the main public spaces – the restaurant and tea salon – Hoffmann has donated some of her impressive collection of mid-century furniture, including Hans Wegner’s Wishbone and Shell chairs, which work remarkably well against this highly painterly backdrop. There are also paintings by the score. Every single door – whether to a humble loo near the bar, or in a bedroom – has an original Pardo painting applied to its wooden surfaces; many of them inspired by nature but also by the Japanese prints that were such a source of fascination to van Gogh. Given that there are 34 rooms, that’s a lot of doors. Their frames were created locally, however. Pardo worked closely with the Arles-based studio of architect Max Romanet, and the door frames, concrete work and handrails were all devised and installed by locals – Pardo has said he wanted a ‘production dialogue’ between both Arles and his Mexican studio. Within the site, there is a separate six-unit residence for artists, which enjoys exactly the same scheme and furnishings. Hoffmann is very generous in her provision of residencies for artists of all kinds (dancers, musicians, photographers) at the Parc des Ateliers; having L’Arlatan nearby means they receive accommodation and food of the highest standard (albeit reasonably priced). The restaurant has an unpretentious, modern and regional French menu, overseen by Michelin starred chef Armand Arnal (whose restaurant La Chassagnette, also owned by Hoffmann, is only 19km away). Sitting at one of the pale pink marble tables, on a 20th-century classic chair, admiring the extraordinary layered and tessellated art work that covers an entire wall separating one half of the restaurant from the other, I was astonished to be told that this same restaurant was previously a ground floor car park – the one major structural transformation of the project. With the palette, the forms and textures he has devised for L’Arlatan, Pardo was apparently inspired both by his beloved Mexico and this famously seductive French region’s landscapes and the quality of light. He has commented that his art is always inspired by its context. Initially, however, the warmth and exuberance of the interiors seems highly exotic, startling, against the calm, pale, stone solidity of the ancient buildings this hotel is formed from, and those in the surrounding streets. 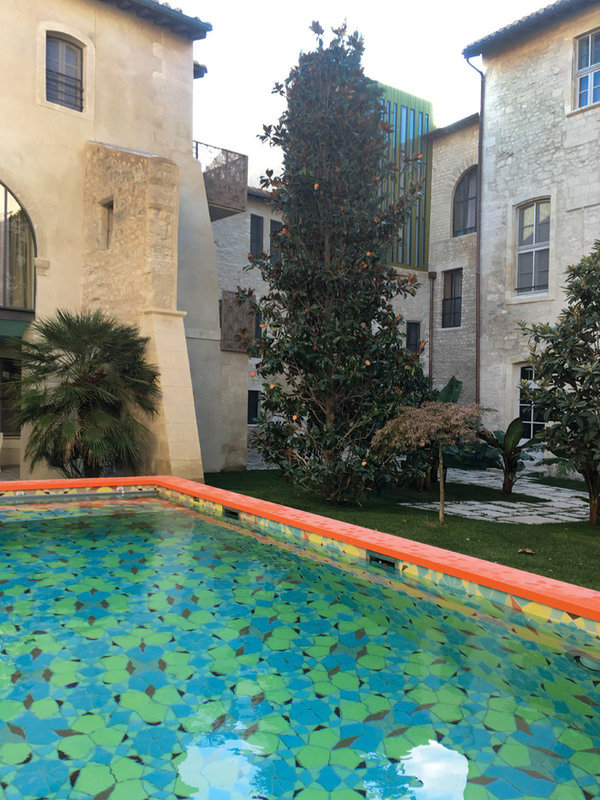 But the genius of his concept is revealed when you are lucky enough to spend a couple of days both in the hotel and wandering around the streets of Arles. You soon realise there is so much of the surrounding colour and texture infused into its rooms: the pale moss-green paint of a set of ancient shutters; rusting ornamental grilles covering a medieval window; the crumbling arches of the nearby Roman relics; all seem suddenly to be of a piece.